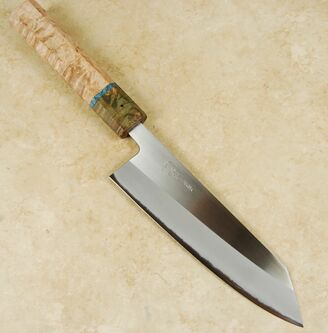 Kohetsu Shinano Blue #2 Bunka 170mm. This line is made using the ever popular Blue #2 steel. 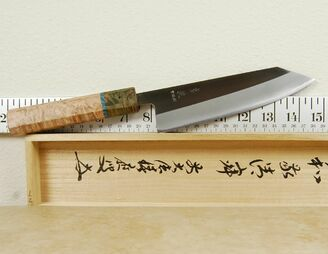 This is by far one of the most loved steels in the world of Japanese knives. It is a high carbon steel that is known for its superior edge retention and its ability to take a more acute edge than White steels. The core steel is hardened to 62 HRC. 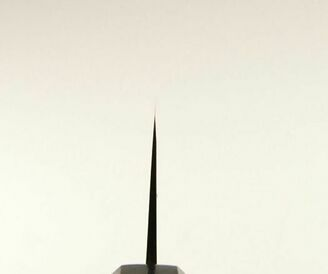 An outer layer of stainless steel is applied san-mai style to protect and strengthen the Blue #2 inner core. It also makes daily maintenance a lot easier. 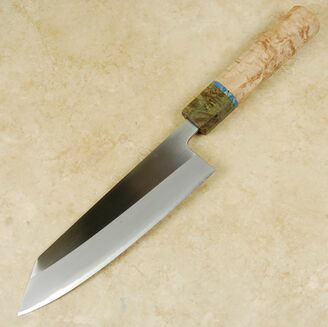 San-mai translates to �three flat things� and it refers to the construction technique used in the manufacture of the blade where two layers of a softer steel are used to encase the central core or �hagane.� The core steel is exposed at the blade edge and also in the spine when viewed from above. The blades have a great looking matte finish which contrasts beautifully with the hamon-look line, where the hagane is exposed at the edge bevel. It has a symmetrical 50/50 grind which is particularly well executed. This knife comes with a sweet custom handle made by our woodworker that features stabilized burl wood that will last and look great for years to come.